Figure A. FITC conjugated Mouse anti Dog CD3 (MCA1774F) and purified Mouse IgG1 isotype control (MCA928) detected with Rabbit anti Mouse IgG1 PE (STAR12A). Figure B. FITC conjugated Mouse anti Dog CD3 (MCA1774F) and purified Mouse anti Dog CD4 (MCA1998S) detected with Rabbit anti Mouse IgG1 PE (STAR12A). All experiments performed on red cell lysed canine blood gated on lymphoid cells in the presence of 10% dog serum. Data acquired on the ZE5™ Cell Analyzer. Mouse anti Dog CD4 antibody (CA13.1E4), a monoclonal antibody specific for canine CD4. CA13.1E4 was clustered at the first Canine Leukocyte Antigen Workshop (Claw) [Cobbold et al. 1992 ] and identifies, by immunoprecipitation a ~60 kDa monomeric protein under both reducing and non-reducing conditions. 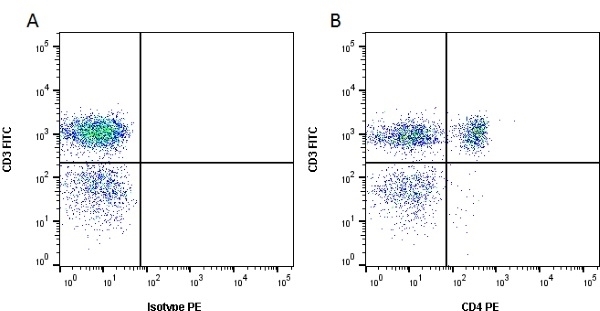 Canine CD4 is a surface glycoprotein expressed by non CD8 expressing T lymphocytes, with similar developmental and functional characteristics to T helper cells described in other mammalian species. Mouse anti Dog CD4 also recognizes a population of CD8 positive cells in the canine thymus (Moore et al. 1992). CD4 expression has also been reported on a population of CD3 positive peripheral blood T lymphocytes which are double positive for CD4 and CD8 (Bismarck et al. 2012 ). Similar reports have been made for cynomolgus monkey (Nam et al. 2000), pig (Saalmuller et al. 1987 , Pescowitz et al. 1990) as well as rat, chicken and human (reviewed Zuckermann 1999 ). Uniquely amongst mammalian species clone CA13.1E4 also recognizes CD4 expressed on canine neutrophils at a similar density to that expressed on canine T helper cells. The functional significance of this is not understood and remains enigmatic in view of the roles described for CD4 in canine and other mammalian species (Moore et al. 1992). Clone CA13.1E4 also demonstrates immunohistological staining of splenic marginal zone macrophages (Moore et al. 1992). Other macrophage populations, such as splenic red pulp macrophages and Langerhans cells do not stain with clone CA13.1E4. Canine CD4 positive T cells can be further characterized according to their simultaneous expression of CD45RA as recognized by Rat anti Canine anti CD45RA clone CA4.1D3 in a manner analogous to that seen with human T cells (Moore et al. 1992). Clone CA13.1E4 has been used amongst a large panel of anti-canine monoclonal antibodies for the study of various lymphoproliferative diseases. T lymphocytes in large granular lymphocyte (LGL) lymphocytosis are negative for CD4 (McDonough and Moore 2000 ). Dogs with chronic myelogenous leukemia demonstrate CD4 positive staining on neutrophils (Tarrant et al. 2001). CD4 expression varies considerably between various canine leukemias. Spleen cells from immunised Balb/c mice were fused with cells of the P3X63-Ag.653 mouse myeloma cell line. Use 25ul of the suggested working dilution to label 106 cells or 100ul whole blood. Izci C et al. (2015) Clinical and light microscopic studies of the conjunctival tissues of dogs with bilateral keratoconjunctivitis sicca before and after treatment with topical 2% cyclosporine. Biotech Histochem. 90 (3): 223-30. Ricklin, M.E. et al. (2010) Characterization of canine dendritic cells in healthy, atopic, and non-allergic inflamed skin. J Clin Immunol. 30 (6): 845-54. Wijewardana, V. et al. (2013) Production of canine soluble CD40 ligand to induce maturation of monocyte derived dendritic cells for cancer immunotherapy. Vet Immunol Immunopathol. 156 (1-2): 121-7. Kamiie, J. et al. (2014) Quantitative analysis of CD3ε in a cloned canine lymphoma cell line by selected reaction monitoring assay. Biosci Biotechnol Biochem. 78 (2): 271-5. Gene Ther. 14 (17): 1249-60. Tai Vet J. 40 (04): 181-190.